A strike at the site of the Burj Dubai - expected to be the world's tallest building - has entered its second day. Some 2,500 labourers at the Dubai site have walked out in a row over pay and working conditions, which sparked a night of violence two days ago. But the main contractor at the site, South Korean firm Samsung, said the action had not affected construction of the skyscraper. The workers are employed by Dubai-based firm Al Naboodah Laing O'Rourke. The builders, who are working on towers next to the tower, are demanding better wages, overtime pay, improved medical care and better treatment from their foremen. Pay for the workers ranges from US$7.60 per day for a skilled carpenter, with labourers getting $4 per day. According to reports from Associated Press, a riot by the disgruntled workers - who smashed cars, offices and construction vehicles - caused an estimated $1m of damage. The labourers have since returned to the construction site, but have refused to pick up their tools, halting work at building surrounding the Burj Dubai. Government labour investigators in the United Arab Emirates (UAE) are currently in talks with the strikers - understood to be Asian - and Al Naboodah managers in an effort to bring an end to the action. 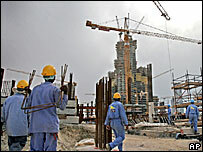 Foreign workers are key to the construction boom in the Gulf region. Millions of migrant workers have flooded in, outweighing the local population. Prestigious projects, like the recent $ 4.1bn airport expansion in Dubai, rely mainly on workers from India, Pakistan, Sri Lanka and Bangladesh. These workers are cheap, usually earning less than $300 a month.